Friday after Thanksgiving found me in the car with Joni heading to a bike race. This was my third time participating in the Gravel Grovel in Norman Indiana. I had only a modest goal to break the five hour mark. In 2012, my time was 5:50 with three flat tires! In 2013, I took a lot of time off the previous year, had no issues mechanically and finished 5:07. The course winds through the southern Indiana country side and unlike the course at Barry-Roubaix for those familiar with that event, the Gravel Grovel includes two significant “mountain bike” segments in the Hoosier National Forest. 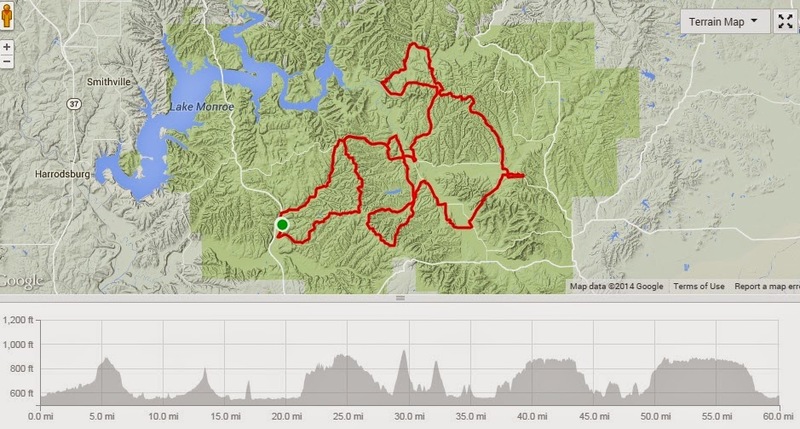 The 60-mile course also includes 3200 feet of climbing, some quite steep. It was actually quite cold and felt colder than the temperature read from my car’s display. 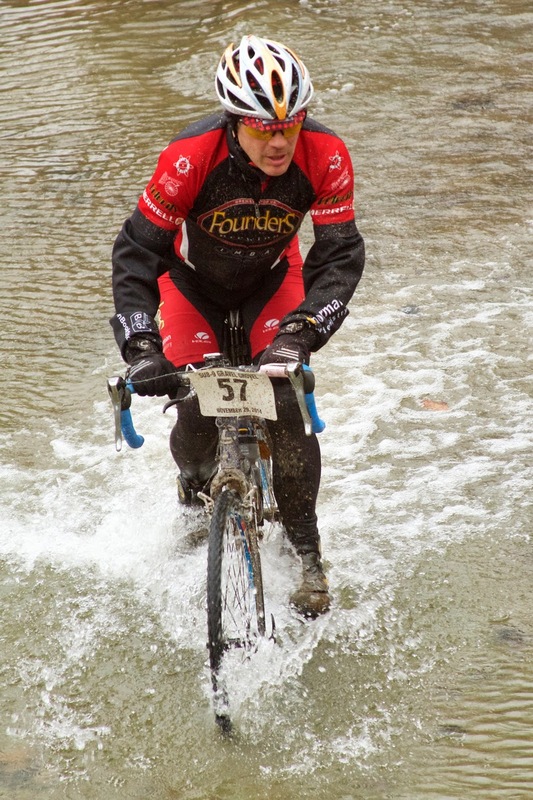 I had started with the same gear I used at Iceman- baselayer, windbreaker, armwarmers and jersey. But as I got my bike ready and the wind blew, it didn’t feel like enough. I then swapped the windbreaker for the thermal jacket. Seven miles into the race I had second thoughts and was getting a bit too warm. That soon ended as the windchill dropped the temperatures and I was VERY glad to have the thermal jacket on. As with most events, I was back and forth with several other riders as different terrain appealed to different skills. There was a six man team with Bertolli jerseys riding really strong. They would often break up in the technical areas and regroup to ride together. As a pace line they hammered and I was able to jump on their back wheel for a few miles at one point. But their team was plagued by mechanical issues and flat tires and they’d pass many of us other riders, then we’d go by them as they repaired some issue. The course finishes with the ever familiar creek crossing. But I just did NOT have the legs this year, finishing in 5:22. I think I just had a busy, busy few days leading up to the event. I have been running regularly with Joni. Leading up to Gravel Grovel I had two 5K running races in which I placed 1st and 5th respectively with times of 22:08 and 21:49. I had been running anywhere from three to six miles an evening. My legs were simply tired. The course was different also. It’s been slightly different each of the last three years and I think was more difficult this year than last. I realized at the 30-mile mark I would not make my goal and almost wished I could DNF. But I rode on and after 40 miles I got a bit of a boost in energy.. or determination. Mile 50, refill of a bottle, take a banana and Hammergel and motor on to FINALLY see the last downhill on the course to the finish. WHEW! Anyway- that closes my cycling season for 2014. This entry was posted in Race Results by dirtybastard. Bookmark the permalink.